Designed by architect Frank Lloyd Wright. Wright's house for interior decorator Oscar Balch was one of his first commissions after returning from Europe in summer of 1911. 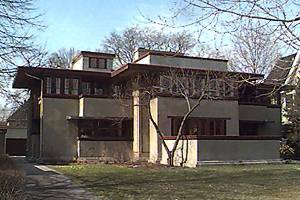 In its stark geometry of form, and in the horizontal linearity of its flat roofs, the house appears to continue the ideas began in his house of 1909 for Mrs. Thomas Gale.